Painters tape is a useful tool when it comes interior painting. Interior painting requires a great deal of preparation. After deciding on the color and any designs/patterns, you will need to do things like move furniture, lay down drop cloths, and clean baseboards. There is another step that do-it-yourselfers often neglect. It is worth spending some time applying painters tape to the room. In some cases, this step is even essential. 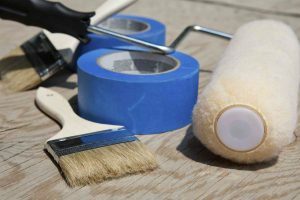 Here are four major benefits of painters tape and why it should be used in on most interior painting projects. Painters tape is rather inexpensive. You can pick up a large roll of it for just a few bucks at your local hardware store. It is also cost-effective because it will make your painting project go by much faster. You are far better off spending a few dollars on a roll of painters tape than making a major mistake that will cost you a lot more money. Try to think of painters tape an excellent insurance policy. Drips are frequently inevitable when it comes to painting, and for that reason, it is important to plan for the worst. Painters’ tape can be applied to any surface and will lessen the chance of mistakes. Time is money, and since there is less of a chance of making a mistake, you can fly through your project after you apply your painters’ tape. Unlike other tapes, painters’ tape was created not to leave a nasty residue behind. You should be assured that you can apply it to any surface without any problems. When the paint has dried, you should be able to peel it off with minimal effort. Painters tape can be applied to any surface. For instance, if you are painting a window sill, you can apply a strip of the tape to the window glass. Painters tape can also be used to create all sorts of attractive designs and patterns on walls. For example, it can be used to create a checkerboard effect or a zigzag pattern.